You want to keep your current clients and acquire new ones. Email can help you do both. A strong email commands attention. Poorly written correspondence often goes unread. 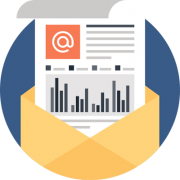 You can’t afford to alienate your readers with sloppy, vague or rambling emails and letters. Susan did an excellent job presenting to the FPA of Colorado. She provided our audience with straight-forward action items that all of us can use. She was able to engage our audience, while giving tips on writing about financial terms and how to clean up email subject lines. Susan gave an excellent presentation to the Houston FPA Chapter. Her presentation was interesting, practical, and above all, applicable to our members’ practices. Personally, my office has been referencing her ideas and recommendations all week. Susan did an awesome job presenting at our annual FPA of MA conference last week. I walked away with some great email strategies. Susan’s live interview made the phone lines light up on my Expert Series interview call! She provided lots of helpful information about how to write effective emails. (I picked up a few pointers myself.) We had numerous questions due to Susan’s talent in engaging an audience. That is quite an accomplishment in a conference call format. Susan did a great job with the FPA Annual Meeting presentation on writing compelling email subject lines. I definitely took away some good ideas and have adopted them already.